The Australian garden tool company Cyclone has launched its new ‘Sculpt’ range of shears and loppers, and I’ve been asked to write a product review! I was delighted at the opportunity to try these products out, as I formally teach pruning classes, have lots to prune in my own demonstration food forest garden, and I’m always looking for tools that make the job easier and save time and effort. In this article we’ll test and review Cyclone’s Hedge Shears and Telescopic Wavy Edge Hedge Shears, and in the next product review we’ll have a look at their Compound Bypass Lopper, Ratchet Anvil Lopper and Telescopic Ratchet Bypass Lopper. Let’s start by looking at Cyclone’s official product release statement to get an idea of what this new product line is all about. Cyclone’s new ‘Sculpt’ range of shears and loppers offers gardeners more power for less effort, comfortable grip and stylish design. The range comprises two new hedge shears and three loppers, and includes Telescopic models for those hard-to-reach branches and stems. 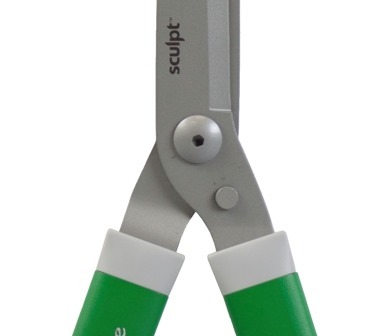 ‘Sculpt’ shears and loppers features transitional profile aluminium handles, soft-touch and wide-palm grips. Its 100% non-stick blades offer friction-free cutting, rust resistance, durability and lasting sharpness. 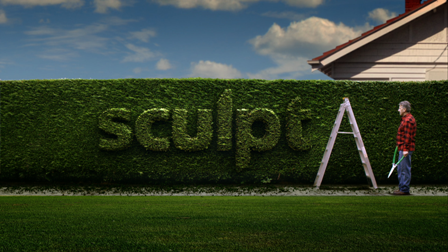 ‘Sculpt’ is available at Bunnings Warehouse, comes with a lifetime guarantee and is priced from $49.98 to $87. No, this isn’t a Bunnings advertisement in disguise, it’s an impartial and independent product review with lots of other useful information. From the above product release statement it appears that at present this range is sold exclusively by one retailer. From the description above, the Cyclone ‘Sculpt’ range definitely promises a lot, and in this series of tests presented over this two-part article we’ll see if it delivers on those promises. I did my own research and checked Cyclone’s existing product lines of similar tools, their current lines only offer a 10 year guarantee, while the ‘Sculpt’ range has a lifetime guarantee, so this range looks like it’s a higher tier of product. While we’re on the topic of hedging and pruning, any DIY information is always welcome, and Cyclone have been very generous to also supply us with a set of instructions on how to maintain hedges. I’ve included these instructions in the next section ‘Prune your Hedges to Perfection’ as they explain which tools to use for which purpose. Formal and informal hedges can frame your yard and provide a natural screen for the home, but can easily become unwieldy. It’s important to prune at least once a year to help stimulate growth and keep them tidy and healthy. While every plant has its own pruning calendar, the general rule is to trim it back during autumn or spring. Deciduous hedges can be pruned in winter, and flowering varieties should be trimmed six weeks after the bloom, unless this falls in the heat of summer. New hedges require formative trimming for the first couple of years after planting. Maintenance trimming should occur once a year for informal hedges and two-to-three times a year for formal hedges. Pruning an informal hedge is much like pruning a normal shrub. Remove dead or damaged parts first to prevent diseases from spreading and insects from burrowing into deadwood. Secateurs or loppers are great for this, especially if the hedge has large evergreen leaves, as these tools will help you avoid unsightly leaf damage. Cyclone’s new Sculpt range offers a compound Bypass Lopper for thicker branches and Ratchet Anvil Lopper for mature woody branches. 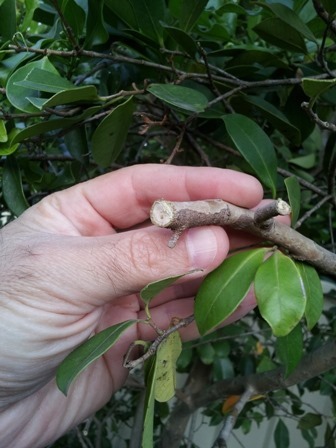 If it’s a formal hedge, start with some general trimming by removing deadwood and protruding branches. Sculpt’s Telescopic Ratchet Bypass Lopper is great for difficult branches requiring extra reach and cutting power. It’s important to prune your hedge so that the base of the plant is shaped wider than the top (known as cutting the hedge to a ‘batter’), which increases the plant’s stability and allows sunlight to reach leaves at the base. A top-heavy hedge can become leafless at the base because of shade. The straight edge that typifies a formal hedge will owe much to the steps you take before you begin to prune and the tools you use. Hand-held tools like Sculpt’s Hedge Shears are perfect for small to medium plants, and will assist with accurate, controlled cutting. 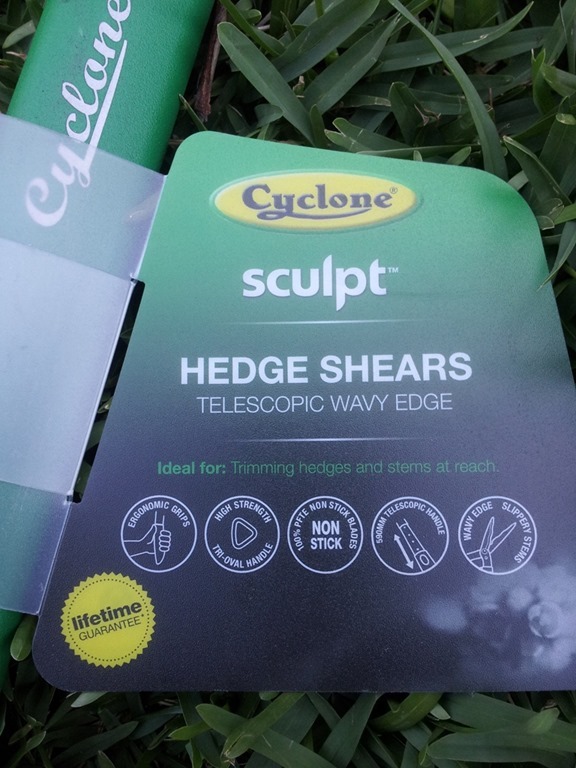 If the stems are slippery, try Sculpt’s Telescopic Wavy Edge Hedge Shears, which have a wavy blade for added grip. For straight-line cuts, create some guides using stakes and string. Position stakes at each corner of the hedge, and tie string between the stakes along the top and bottom borders of the hedge. You can use the horizontal string rulers as guides for straight cutting. To create a batter, position stakes at each corner slightly wider than the originals and tie string between them along the bottom of the hedge to create wider string guides. Cut from the wider guide along the bottom of the hedge and taper as you move upwards so that you cut along the narrower string guide at the top. This will create the gentle pyramid effect of a batter. A manicured, healthy hedge can add real value to your home, and right now is the perfect time to start pruning some plants and getting ready to cut back others. As we’re an educational site, this product review will also explain how to pick the right garden tool for the task at hand, and how to use these garden tools properly. If you’re wondering how hedges fit in with permaculture, sustainable gardening and produce gardening, then please have a look at the article The Case for Edible Hedges on this site. Hedges shears, which look like very large scissors with long straight blades, are designed to remove a lot of plant material with each cut. Pruning tools cut one branch at a time, while hedge shears are used to cut many small branches all at once with each cut. Hedge shears are designed to cut soft growth accurately and precisely while also being able to chop cleanly through woody material up to 1cm thick. Blades can be straight or wavy. The wavy blades are better suited to heavier cutting as thicker branches can slip along straight blades during a cut and the wavy blades hold the branches in place to stop then sliding along, giving a cleaner cut. Hedge shears can be used to cut hedges flat and straight, as in formal hedging, or they can be used to create all manner of interesting and wonderful shapes as is done in topiary pruning. They also have other uses in the garden which can really save a lot of time and effort. By the end of summer many perennial plants grow tall, flower and then go to seed, and need to be cut back to stop them getting too large and untidy. Many common herbs also need to be cut back hard at the end of the season, and I’ve found hedge shears do a great job on herbs like lemon balm, catnip, oregano and all types of mint for example. Another use of hedge shears is to deadhead spent flowers such as lavender or to tame overgrown vines, where it would be too time consuming to prune with secateurs. 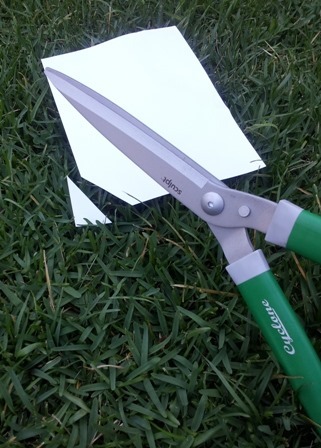 Even though they’re not designed for lawn maintenance, I routinely use my hedge shears to trim the edges of my buffalo grass lawn, the longer blades cut faster and more strongly than grass shears. 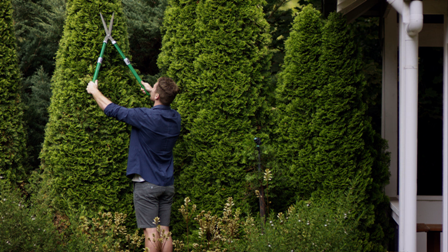 Now that we’ve covered how hedge shears are used, let’s test the Cyclone hedge shears! 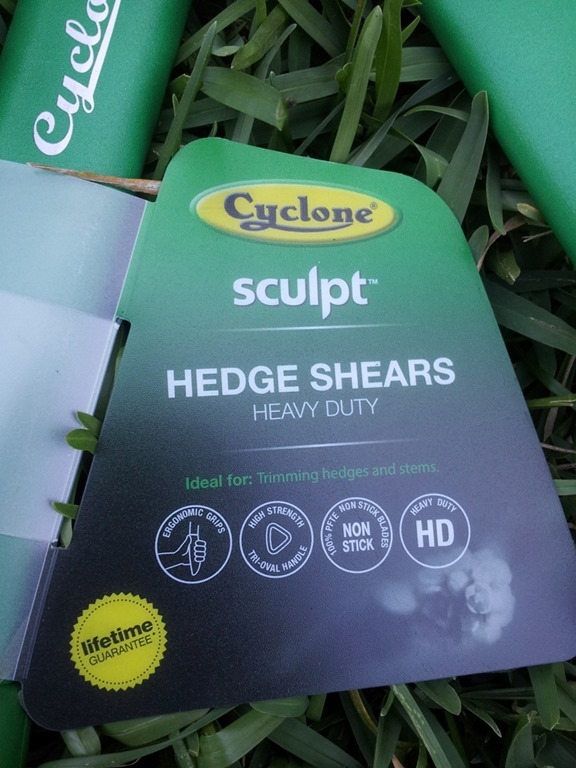 Credits: Cyclone Tools Pty Ltd – Hedge Shears (RRP $49.98) –– perfect for a simple clean up or trim of hedge foliage. Credits: Cyclone Tools Pty Ltd – Telescopic Wavy Edge Hedge Shears (RRP $69.98) – great for slippery stems, which are gripped more easily by the wavy blade, while push-button telescopic handles extend cutting reach. The way I like to conduct a review is by first gathering any relevant information, and since no one can explain a product better than the people who designed it, I’ve I’ve reproduced the Cyclone ‘Sculpt’ product range description below ! Cyclone’s new ‘sculpt’ range of hedge shears and loppers offers Australian gardeners more power for less effort, comfortable grip and stylish design at a competitive price. The range, comprising two new hedge shears and three loppers, is a striking green for greater visibility in the garden, with sleek contours and a unique comfort grip that allows all levels of gardeners to do what they love longer. 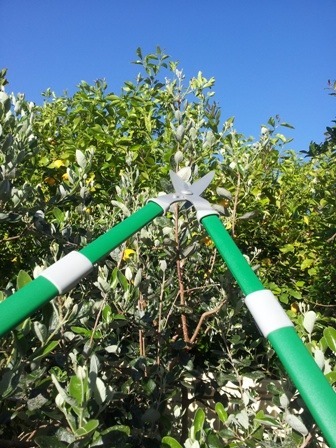 The range also includes Telescopic models for those hard-to-reach branches and stems. What makes ‘sculpt’ unique are their patented ‘transitional profile handles’. To deliver maximum cutting power, the handles are oval shaped near the pivots and cutting blades, where power is critical, while the grip ends taper to a tri-oval shape to distribute pressure evenly in your palms, preventing fatigue in the hands. This should set our expectations of the reviewed product, and provides us with a point of reference to test the manufacturer’s marketing claims and see how the product compares in real-life tests. Before even handling these hedge shears, their aesthetics caught my eye. There’s no mistaking the fact that the design is stylish. They are a vivid green which is very tasteful and professional looking, and by design the colour stands out amongst the greenery so that they won’t be easily misplaced. The blades have a smooth grey finish, this is the ‘100% non-stick blades’ coating which matches nicely with the green handles and grips. Picking up and holding these hedge shears, I found them well balanced. They somehow feel quite solid while at the same time being light and easy to handle. Checking them on the scales, they are indeed nice and light, for me at least. The Straight Hedge Shears weigh 925g while the Telescopic Wavy Edge Hedge Shears weigh only a little more at 1210g. The grips on the handles are made of a firm and durable material with a very good grip, some sort of hi-tech material that I can’t recognise off hand. In the hands, the grips are very comfortable and ergonomic. I have large hands and I find there’s plenty of space on the grip with room to move up and down. Being a technical writer, I really appreciate informative labelling, and these labels are well designed and tell us a lot about the product. The straight hedge shears are in fact Heavy Duty Hedge Shears, the label makes tool selection easy by identifying the intended use “Ideal for: trimming hedges and stems”. The label also tells us these hedge shears have ergonomic grips, high strength tri-oval handles, and 100% PTFE Non-stick Blades (these blades use the tried and proven Teflon coating, which also explains why they would also be rustproof). There’s also a lifetime guarantee, which speaks very clearly about the confidence that Cyclone has in the durability and quality of this product range. The label for Telescopic Wavy Edge Hedge Shears describes the intended use “Ideal for: trimming hedges and stems at reach”. Just like the Heavy Duty Hedge Shears, this model also has ergonomic grips, high strength tri-oval handles, and 100% PTFE Non-stick Blades and a lifetime guarantee. The additional features this model boasts is the extendable 590mm telescopic handles and wavy edge for slippery stems. As far as first impressions go, these Cyclone ‘Sculpt’ hedge shears look great, handle well thanks to their ergonomic design, and feel very solid and dependable. Let’s see how they perform doing the job they’re designed to do – hedging! Well, as the old expression goes “the proof of the pudding is in the tasting” and the proof of any garden tool is in the testing! Off we go to the garden to give these hedge shears a good test run. Out in the garden ready for testing! In testing any product, it’s important to identify the key features or attributes to be tested. In the series of tests outlined below we’ll determine how these products performs against of these test criteria, then we’ll assess the overall performance to draw our conclusions. Without further ado, it’s time to begin testing! A quality edged product comes nice and sharp when you first purchase it, the term often used to describe this phenomenon is ‘factory sharp’. 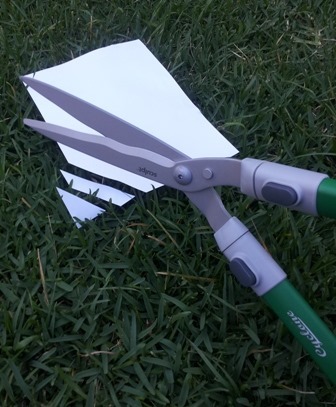 I wasn’t sure how sharp these hedge shears would be, so i gave them the ultimate sharpness test – cutting office paper! The paper cutting test shows how keen the edges are and how well the blades align with each other. It’s a clear visual demonstration of how clean a these shears can make. First to be tested, the straight blade hedge shears. Cuts paper cleanly like a pair of paper scissors! I must admit i was surprised how sharp the straight blade hedge shears were, they cut the paper so clean and straight, with a precise, crisp cut, just like how a pair of brand new office scissors would cut. The telescopic wavy edge hedge shears managed a very precise clean cut too, so there’s consistency in the quality control here. Super sharp straight from the factory! To put this into perspective, this is quite an achievement as we were able to make effortless clean cuts in office paper with shears weighing around 1kg with 25cm long cutting blades that are 4mm thick. That’s really impressive in my books. Cyclone has really put attention to detail and done a decent sharpening job on these garden tools. Now, before anyone dismisses the paper cutting test for its novelty factor, it is also a good test for edge retention – how well the edge holds up to pruning without getting blunt and needing resharpening. 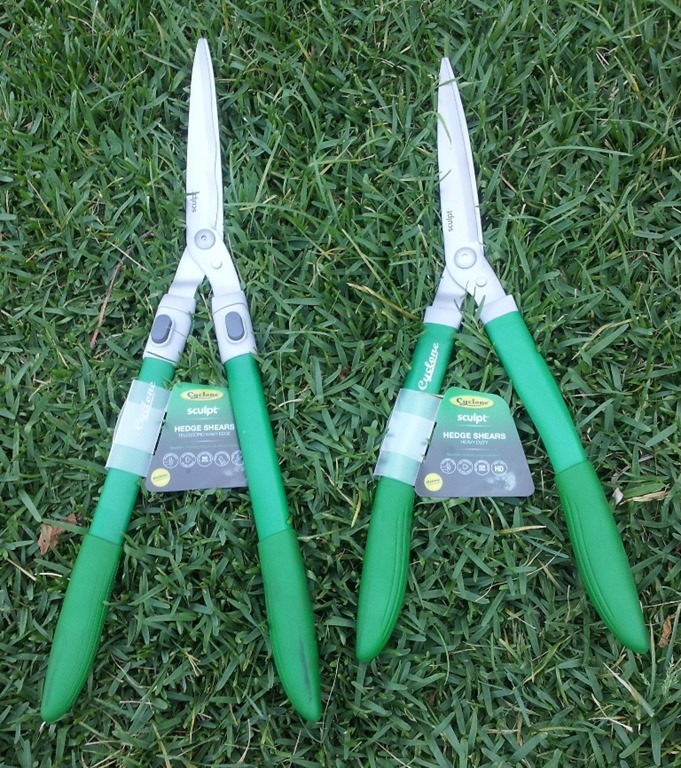 These hedge shears were used to prune a random range of plants and then two trees with some thick woody branches, as you’ll see later in this review. After all the pruning tests were completed, the paper cutting test was repeated once again to see if the cutting caused any blunting of the edges. The result was satisfying, both hedge shears were just as sharp as when they first tested on the paper cutting test, with no observed decrease in sharpness. I’m not sure of what type of steel is used in these blades or what level of hardness the blades are heat treated to, as this information isn’t specified, but they appear to be made of a quality steel that holds its edge very well. For this reason it was not possible to test how easily they resharpen, which is an ideal outcome for such a a short test. This is where the fun begins! My aim was to put these hedge shears through their paces to see what they could really do. 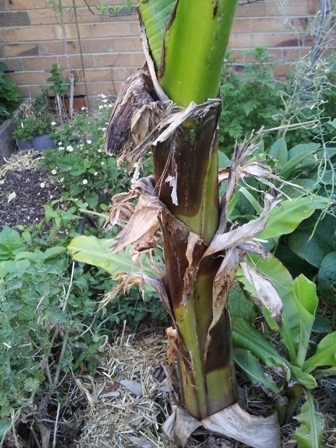 The first test was a real nuisance pruning job in the garden, removing the old leaves around the stem of a banana plant. These old leaves are thin and very fibrous, and when moist, tend to simply jam the blades of pruning tools if they aren’t very sharp or the blades don’t mesh together perfectly. After: Hedging shears perform flawlessly! 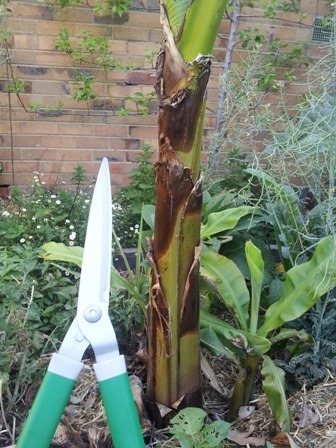 Using the straight bladed heavy duty hedging shears, I systematically cut all old the leaves around and along the stem of the banana plant without any hang-ups, the cutting was clean and effortless, with no jams or clogging of the blade. I tested both hedging shears on some old dry raspberry canes, and they performed flawlessly detailing my raspberry trellis. I was able to single out the old canes with the long blades and cut them out accurately without chopping off any new canes. I normally use secateurs for this job but the shears saved my hands from the prickly stems. Next test, some real hedging work! My cherry guava tree was a rather overdue for a prune, in fact it had never been cut back and was getting a bit large. 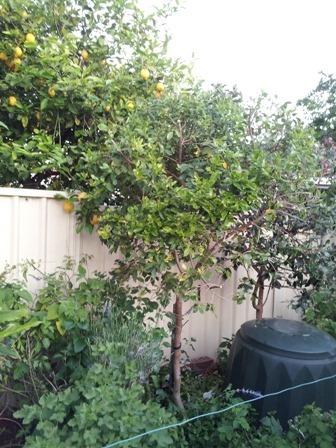 To get an idea of the size, there’s a giant 400L compost bin perched below the tree which is visible in the right hand corner of the photograph below, and a 1.8m high steel Colorbond Fence behind it. Never pruned cherry guava, growing a bit too large, well above the 1.8m fence in the background, in desperate need of hedging! 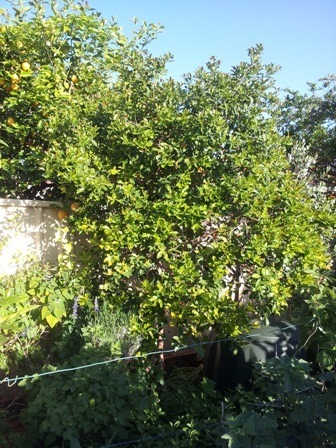 Similarly the feijoa tree beside it had been previously pruned once using secateurs to get it to bush out a bit and keep its size down. Pruning it with secateurs was a tedious task as I had to squeeze in behind and under the tree which is against a fence, and now it needed another pruning as it was hard up against the cherry guava to its left side. Feijoa blending into a cherry guava on its left, no shoulder room here! As both of these trees had grown high, and access was limited, I figured this would be an ideal test for the telescopic hedge shears. Pruning trees from a ladder is never fun, in fact it can be quite dangerous, and that’s where telescopic or extendable hedging shears, extendable loppers and pole pruners are irreplaceable. The picture below demonstrates the kind of reach you get with the Telescopic Wavy Edge Hedge Shears, it’s easily over 2.5m. Credits: Cyclone Tools Pty Ltd – High reach is very easy with the Cyclone Telescopic Wavy Edge Hedge Shears. Fully extended, these hedge shears were easily able to reach to the very top of both trees, and around the sides too. I was somewhat disappointed at how quickly I managed to complete the job, I was actually enjoying hedging up my cherry guava into a neater looking ball-on-a-stick shaped tree. The proper horticultural term for this pruning shape is a ‘standard’, much like ‘standard roses’ we are all familiar with. I must admit after this test I became a real fan of these extendable hedge shears. Fully extended loppers reach well over the tree canopy of the feijoa. Next, I switched to the straight-bladed hedge shears and did a bit more hedging close up to compare the difference. I really liked these for detail work that was within easy reach. The extendable loppers with their longer handles gave a lot more leverage and I enjoyed using them on some really tough cuts. The efficiency of these tools is incredible, both trees were fully hedged up in a few short minutes. Here are the ‘after’ photos, with the trees now hedged to a manageable size. As new growth springs forth, both these trees will bush out nicely, and the foliage will get denser, and the amount of fruiting branches will increase. 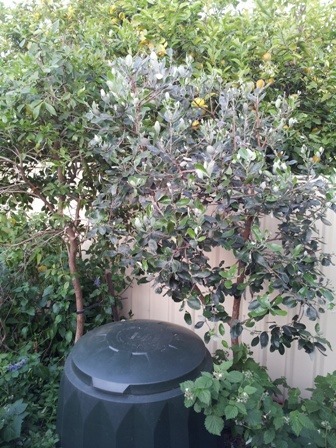 A much tidier hedged cherry guava, compost bin now visible, and path now unobstructed. 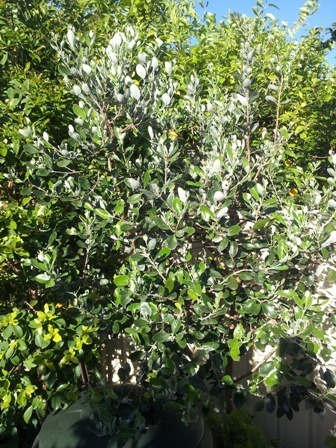 The green-silver leafed feijoa now appears as a distinct tree separate from its neighbour. Maybe i was overdoing it a bit, but the Telescopic Wavy Edge Hedge Shears managed to cut through some fairly thick woody branches up to 1cm thick. I tried the same thick branches with the straight bladed hedge shears and they cut through fairly easily too, without slipping. They are classed as heavy duty hedge shears after all. Here is an example of some of the thick branches both hedge shears managed to cut through. Thick branches around 1cm thick were no obstacle to either of the hedge shears. When I cut through these thick branches, I was surprised that no shock was transmitted to my wrists. Many hedge shears use two rubber stops or buffers that bump into each other to absorb the shock. The ‘Sculpt’ range hedge shears instead have a solid steel stub that serves a s a stop which is part of the blade, you can see it on the bottom right below the centre pivot bolt in the picture below. This got me thinking about how these hedge shears manage to absorb the shock without rubber buffers that you see on other hedge shears. It’s obvious a lot of design has gone into this product. I strongly suspect that the transitional profile aluminium handles and soft-touch, wide-palm grips soak up a lot of the shock. Not being content with my nicely hedged trees, I scoured the backyard garden randomly testing my newly beloved hedge shears on whatever looked like it needed a trim, and at no point did either of these hedge shears disappoint. Finally the sun was beginning to set, and it was time to pack up, and that can only mean one thing, the totally necessary but least enjoyable part of gardening, cleaning the garden tools! Pruning equipment usually gets covered in plant and tree sap which must be removed otherwise it leads to staining or even rusting of the blades, and sometimes the stuff clings quite strongly to the blades and resists removal. Curious to see how well the non-stick Teflon coating on the blades works, I simply rinsed the blades under the tap, and much to my surprise and delight, the blades washed perfectly clean. I wiped them dry and that was it, the fastest post-pruning clean-up ever. The non-stick coating really works well! Only time will tell how durable these hedge shears really are, and how well the Teflon finish wears, but during this short but intense test I possibly pushed them beyond reasonable limits and they really delivered, so I can can say that I believe these would be very dependable over the long haul. The lifetime guarantee gives me confidence as a gardener that these hedge shears will really last. 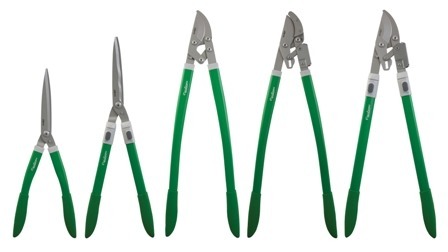 I’m actually looking forward to using these hedge shears to continue to shape my trees and to cut back various perennial plants, including many herbs that need to be cut back hard at the end of the growing season. I reckon Cyclone are on a winner with their new ‘Sculpt’ range. I am very impressed with the ergonomics, the build quality, the sharpness and the durability of these hedge shears. A lot of design has gone into these, and it shows when you use them, the way they feel, balance and respond through a range of hedging tasks. They offer great value for money at their recommended retail prices considering the quality of these products and a lifetime warranty. I’m definitely sold on these and would recommend them. Deep Green rating for Cyclone ‘Sculpt’ range Hedge Shears is 5 stars! In the second part of this review, we’ll test the three pruning products of the Cyclone ‘Sculpt’ range, the Compound Bypass Lopper, Ratchet Anvil Lopper and Telescopic Ratchet Bypass Lopper. This entry was posted in Product Reviews and tagged Compound Bypass, cyclone, garden tools, Hedge Shears (658006), hedging, Lopper (659126), loppers, product review, Prune your Hedges to Perfection, Ratchet Anvil Lopper (659140), sculpt, shears, Telescopic Ratchet Bypass Lopper (659171), Telescopic Wavy Edge Hedge Shears (658112). Bookmark the permalink. Just wondering how you would sharpen a teflon coated pruning tool? Exactly the same way that you would sharpen a regular blade, no different! When you sharpen the blades of shears, loppers or secateurs, you only sharpen the very edge. If your edges need sharpening, then the edge would have worn, along with the Teflon coating on that very thin edge surface, so when you resharpen, you’ll create a new edge, but the Teflon on the rest of the blade will remain untouched.